Since their inception in 02003, the Seminars About Long-term Thinking have featured over 100 speakers from a wide range of disciplines. 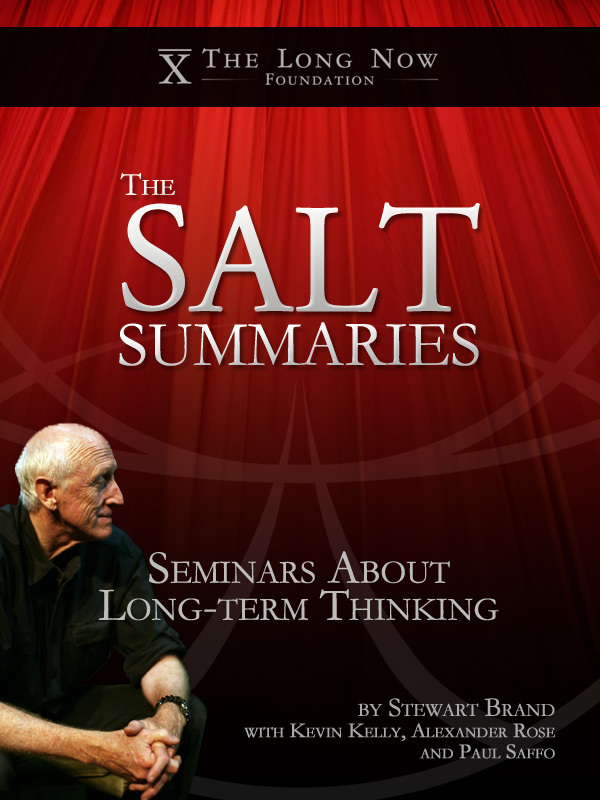 Curated by Stewart Brand, each of these Seminars address some aspect of long-term thinking. From the ideas presented and discussed in the live event, he crafts a summary which captures and elucidates these ideas. A few days after a Seminar, this summary gets posted to the SALT list and blog, but we also collect these distillations in a book, “The SALT Summaries”. Every six months we update the Kindle eBook with the most recent Seminars, and we wanted to let our readers know how they can now update their Kindle book. After you login to your Amazon account, go to the Manage Your Kindle page. On that page, you should see the cover of the book with an update option hovering above it. If you click update, the update should transfer to all of your devices. Thank you for supporting the Seminars About Long-term Thinking.